Sid Veda’s got an identity crisis—but it’s sort of his own fault. “Sid” came easy—his 10th grade gym teacher at Wilson High School in West Lawn, Penn. gave him the nickname and it stuck. He wasn’t the only one who couldn’t pronounce the ultra Indian name his parents (who moved from India to the U.S. before he was born) gave him. The Maryland-born actor and comedian (www.sidveda.com) later learned that “Veda” translates to “knowledge” in Sanskrit–perfect for a guy with an MBA in Finance (with an emphasis on mathematics) from Boston University. He also majored in actuary mathematics as an undergrad at Penn State. For millions of TV viewers these past two years, however, Veda is known by still another moniker: Chad, the Brillo haired, thickly mustachioed half of Ranjit and Chad, “hosts” of “Tech&Talk” on the hilarious series of commercials for mobile phone service provider MetroPCS. Anjul Nigam plays his zany cohort. 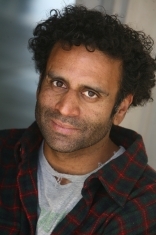 As perhaps millions of Americans rushed to change carriers in the hopes of getting tech support from “Chad,” Veda also played a similar role (character name: Manavendra) on a few episodes (including the pilot) of NBC’s 2010-11 sitcom “Outsourced” directed by Ken Kwapis, simultaneously embracing and lampooning the stereotypes associated with his Eastern Indian heritage. Among numerous other commercial appearances, Veda’s resume includes spots for Wendy’s and a Super Bowl ad for Heineken starring Brad Pitt and directed by Golden Globe winner David Fincher (“The Curious Case of Benjamin Button,” “The Social Network”). As a comic, Veda has opened shows for comedy stars Russell Peters (also of Indian heritage) at the New York Comedy Club in fall 2002 and for Chris Rock at the Hollywood Improv in April 2008. After studying and working in Boston, he moved to Hoboken, N.J. followed by Manhattan’s Upper West Side in hopes of finding work as an actor and comedian. Encouragement came in unique forms. A cover band in Hoboken invited Veda onstage to sing their Rage Against the Machine songs (“Bulls on Parade,” “Killing In The Name Of” and “Guerilla Radio”) and he began taking improv classes and got involved in theatre with the Upright Citizens Brigade. He also did standup at prominent NYC venues like the New York Comedy Club and the Boston Comedy Club. “I braided my hair in cornrows to sing with this band and I began to get the stage bug again. Somewhere along the way at a happy hour,” Veda says, “I randomly met the playwright Anuvab Pal who wrote Chaos Theory. As we were talking, he mentioned that I would be perfect for a role in his play. He was right. Just ask me. Two other prominent artists with Indian heritage were also key figures in Veda’s decision to pursue acting after working several stints as an actuary and earning his MBA. In early 2004, he starred in “Huck and Holden” which ran in the Festival of New Works at NYU’s Tisch School of the Arts. The play was about literary icons Huckleberry Finn and Holden Caulfield written by Rajiv Joseph, whose later work “Bengal Tiger at the Baghdad Zoo” was a finalist for a Pulitzer Prize in 2010. Veda was also inspired by the mainstream success of actor Kal Penn, who was born in New Jersey to Indian immigrants; Penn broke through as Kumar in Harold and Kumar Go to White Castleand later starred as the title character in National Lampoon’s Van Wilder: The Rise of Taj. Many performers who move across the country to pursue this type of career have to listen to their parents say, “Just don’t quit your day job.” Veda doesn’t have to – he still has his! He squeezes in auditions and acting gigs while working full time for DBC, a financial software company. He’s been with the company 11 years (since receiving his MBA) and is the epitome of the cross country telecommuter, working from his condo in West Hollywood. Irony of ironies, he’s kind of got the same job “Chad” has – he’s in tech support. “On the couple of episodes of Outsourced I appeared on, I was in the show’s green room with my laptop open, answering emails,” he says. “I was using this particular program to help investment bankers across the country structure municipal bond deals. Bankers were sending me files that I needed to generate a schedule of payments. It’s a very specialized area, and I talk to them in a voice that sounds nothing like Chad, of course!